After draining his life savings to enter a team in the Rucker Classic street ball tournament in Harlem, Dax (LilRel Howery) is dealt a series of unfortunate setbacks, including losing his team to his longtime rival (Nick Kroll). There’s only one thing left to do: Enlist the help of Uncle Drew. The RiderBased on a true story, a once rising star of the rodeo circuit, Brady is warned that his competition days are over after a tragic riding accident. Back home, he finds himself wondering what he has to live for when he can no longer do what gives him a sense of purpose: to ride and compete. In an attempt to regain control of his fate, Brady undertakes a search for new identity and tries to redefine his idea of what it means to be a man in the heartland of America. Rated R.
Ocean’s 8Upon her release from prison, Debbie, the estranged sister of legendary conman Danny Ocean, puts together a team of unstoppable crooks to pull of the heist of the century. Their goal is New York City’s annual Met Gala, and a necklace worth in excess of $150 million. Rated PG-13. Sicario: Day of the SoldadoIn the drug war, there are no rules – and as the cartels have begun trafficking terrorists across the U.S. border, federal agent Matt Graver (Josh Brolin) calls on the mysterious Alejandro (Benicio Del Toro), whose family was murdered by a cartel kingpin, to escalate the war in nefarious ways. Alejandro kidnaps the kingpin’s daughter to inflame the conflict – but when the girl is seen as collateral damage, her fate will come between the two men as they question everything they are fighting for. 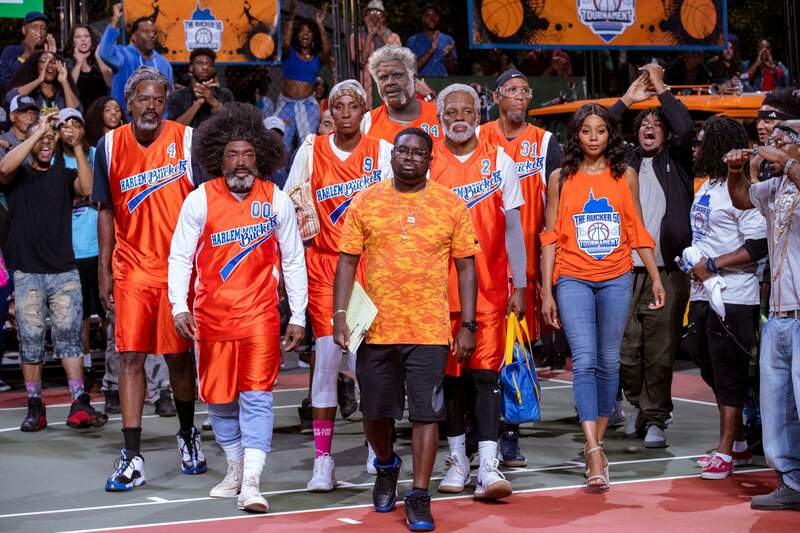 Rated R.
Uncle DrewAfter draining his life savings to enter a team in the Rucker Classic street ball tournament in Harlem, Dax (LilRel Howery) is dealt a series of unfortunate setbacks, including losing his team to his longtime rival (Nick Kroll). Desperate to win the tournament and the cash prize, Dax stumbles upon the man, the myth, the legend Uncle Drew (NBA All-Star Kyrie Irving) and convinces him to return to the court one more time. The two men embark on a road trip to round up Drew’s old basketball squad (Shaquille O’Neal, Chris Webber, Reggie Miller, Nate Robinson and Lisa Leslie) and prove that a group of septuagenarians can still win the big one. Rated PG-13. Jurassic World: Fallen Kingdom(Also available in 3-D with surcharge) It’s been three years since theme park and luxury resort Jurassic World was destroyed by dinosaurs out of containment. Isla Nublar now sits abandoned by humans while the surviving dinosaurs fend for themselves in the jungles. When the island’s dormant volcano begins roaring to life, Owen (Chris Pratt) and Claire (Bryce Dallas Howard) mount a campaign to rescue the remaining dinosaurs from this extinction-level event. Owen is driven to find Blue, his lead raptor who’s still missing in the wild, and Claire has grown a respect for these creatures she now makes her mission. Arriving on the unstable island as lava begins raining down, their expedition uncovers a conspiracy that could return our entire planet to a perilous order not seen since prehistoric times. Rated PG-13. Incredibles 2(Also available in 3-D with surcharge) Everyone’s favorite family of superheroes is back – but this time, Helen (voice of Holly Hunter) is in the spotlight, leaving Bob (voice of Craig T. Nelson) at home with Violet (voice of Sarah Vowell) and Dash (voice of Huck Milner) to navigate the day-to-day heroics of “normal” life. It’s a tough transition for everyone, made tougher by the fact that the family is still unaware of baby Jack-Jack’s emerging superpowers. When a new villain hatches a brilliant and dangerous plot, the family and Frozone (voice of Samuel L. Jackson) must find a way to work together again. Rated PG. TagFor one month every year, five highly competitive friends hit the ground running in a no-holds-barred game of tag they’ve been playing since the first grade – risking their necks, their jobs and their relationships to take each other down with the battle cry: “You’re It!” This year, the game coincides with the wedding of their only undefeated player, which should finally make him an easy target. But he knows they’re coming ... and he’s ready. Based on a true story, “Tag” shows how far some guys will go to be the last man standing. Rated R.
Solo: A Star Wars StoryThrough a series of daring escapades deep within a dark and dangerous criminal underworld, Han Solo meets his mighty future copilot Chewbacca and encounters the notorious gambler Lando Calrissian, in a journey that will set the course of one of the Star Wars saga’s most unlikely heroes. Rated PG-13.